Andersonville is considered one of Chicago's hottest neighborhoods. It is renowned for its unique commercial district, comprised almost entirely of locally owned, independent businesses. In an economically challenging time, many of the small business owners in Andersonville that I spoke with today told me they were holding their own. One of the reasons is that the community really supports local business. Small business is a huge success story in Andersonville. A local grassroots community-wide initiative to help support the unique and independent businesses in Andersonville is on by challenging neighbors to think about how they spend 20 bucks. They are asking people for the next 20 weeks to commit to spending 20 bucks each week in Andersonville. The more people who participate in the challenge, the more invested to keep Andersonville a great place to eat, drink, shop and live. Other communities need to take notice. These campaigns are one of the many reasons why Andersonville has built a solid network of local support. Personally, I love this town and it is one of my favorite neighborhoods in Chicago. It is a fascinating blend of old school charm and new order magic. There are so many intriguing things about Andersonville yet it has a real hometown feel. For one thing, the residents are super friendly. Also, each and every block has an out of the ordinary mix of stores – no two quite the same. Every corner has a couple of attractive benches and this past summer, they were filled with locals absorbed in the chit-chat of every day life. Could I live in Andersonville? Yes, Andersonville is definitely my kind of neighborhood. 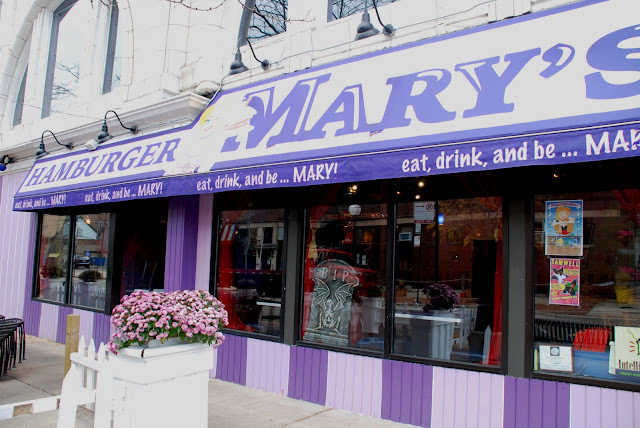 Restaurants abound in Andersonville and you get everything from American - the very famous Hamburger Mary’s (5400 N. Clark) - to Ethiopian to Swedish. One thing I noticed is that there are a dozen or so really distinctive places to go for breakfast. I love breakfast and Ann Sathers (5207 N. Clark) is a Chicago mainstay that serves up a variety of very unique Swedish and traditional dishes. There is also an authentic Swedish Bakery (5348 N. Clark) that would put every celebrated baker to shame with the exception of my grandmother. There is an adorable little deli, JB’s (5501 N Clark) with an old fashioned pharmacy in back. 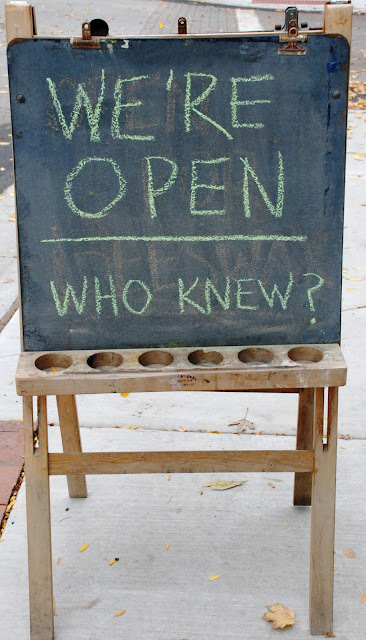 One of the most uncommon place is The Travelers Café (5317 N. Clark). They offers live music on Mondays, sells coffee in bulk and is a quiet spot for a light lunch. The boutique in the back of the cafe is crammed with travel books, artwork, textiles, gifts and jewelry from around the world. I found a pair of really adorable and colorful fingerless warm wool gloves (thought that these would be great for photography this winter) for $14.00 - a steal. In the very front of the cafe is an elevated area where patrons remove their shoes to lounge among the pillows that furnish the floor. To complete the global atmosphere, clocks on the wall keep the current time in various countries. The Wooden Spoon (5047 N Clark) is the local cooking school and offers a great mix of classes with a variety of local chefs. Humorously, they named their classes with very unforgettable names like Say Cheese!, Fire and Ice and The Italian Job just to name a few. Shopping – You will not be disappointed! 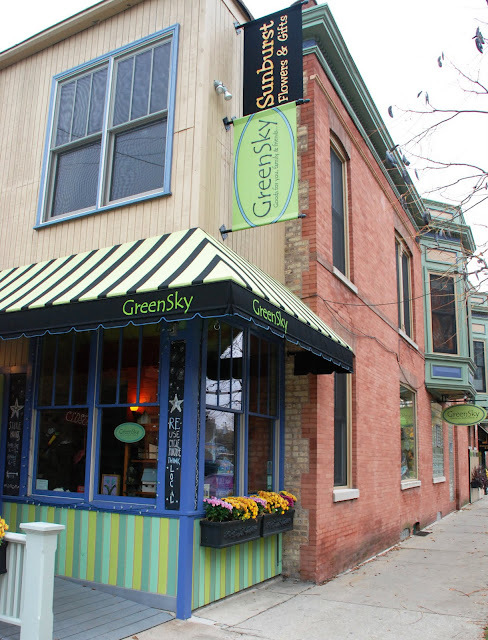 GreenSky (5357 N. Ashland) is a very unexpected eco-boutique offering home décor, artisans, and eclectic items. There were so many delightful and out of the ordinary items in this shop, I am planning on doing much of my Christmas shopping there. Nadeen Kieren, the owner, is married to a local Architect who has done a lot of the historic restoration of the area. I loved her enthusiasm and she took me through a lot of the artists who play a part in establishing the stylish environment created inside this shop. I somehow missed my favorite, the Brown Elephant Resale Shop (5404 N. Clark) which is one of those places where you can find a good deal if you happen to be there on the right day. For shoes, Alamo Shoes (5321 N. Clark) has all of the latest in footwear styles. There is also a small running store – the Runner’s Edge (5243 N. Clark) which has a staff that are both knowledgeable and entertaining. They carry a lot of running lines that I have not seen at other Chicago running stores. The Andersonville Galleria (5247 N. Clark) is in the heart of the thriving Andersonville retail corridor. It is a retail market building that currently features over 90 tenants offering apparel, jewelry, artwork, home furnishings, giftware, accessories, antiques, fair trade, and gourmet treats. One of the featured artists is Char Marie Flood, who does fantastic photography. She had very stylish little black and white photos hanging on simple, sterling silver settings. This is also a great location to find one of a kind holiday gifts. One of the logical things that Andersonville does is to have their farmers market in the late afternoon. At CLARK & BERWYN, the market runs from June 24-September 9 (although they extended it this year) on Wednesdays from 4-8pm. Can’t tell you how many times I have missed my local Farmers Market because it is in the morning on Friday. Andersonville pulls in a huge crowd with worker friendly hours and a impressive selection of produce. Andersonville has a very active Development Corporation which plans outstanding community events such as dessert crawls (my favorite) and wine walks. They are famous for the Midsommarfest, Andersonville's annual summer street festival, now entering its 44th year. Each year, nearly 40,000 people crowd Clark Street from Foster to Catalpa for two days of music, dancing, entertainment, and delicious food. One of the authentic Swedish festivals is that of St. Lucia. A Sicilian tradition adopted by the Swedes, a celebration of lights prevails over the darkest time of the year. Each year the specially chosen Lucia girls lead a torch-lit procession down Clark Street. On December 13th this year, that is one Chicago tradition you do not want to miss. Check out this legendary neighborhood where even you may want to put down some roots! Andersonville’s magic will immediately pull you in!